Above, students work on their solar boats in preparation for May 19-21. 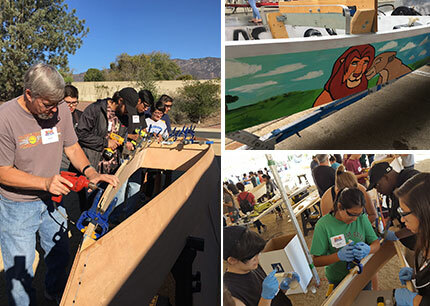 More than 700 students from 43 Southern California high school teams will culminate six months of work this weekend at a three-day racing competition at Metropolitan's Lake Skinner in the Temecula Valley. Solar Cup is a Metropolitan education program that teaches students how to apply math, science and engineering lessons learned in the classroom to the real world challenge of building the fastest solar-powered boat possible. The competition takes place this weekend from 8 a.m. to 4 p.m. and is open to the public. In the 15 years since Solar Cup began with eight teams and 80 students, it has grown into the nation's largest solar-powered boat competition. Along the way, more than 10,000 young men and women have participated in Solar Cup competitions, where they’ve learned about water resource management, alternative energy development and sustainability and been inspired to pursue careers in math, physics, engineering and environmental science. Learn more and watch a video recapping last year's event. How Do We Know California WaterFix Will Protect Delta Fish? Why Is The Delta Smelt So Important? Watch the Spanish language WaterFix video. Poised to put more water in storage in 2017 than any year in its history, Metropolitan Water District’s Board of Directors urged residents and businesses in Southern California to continue water savings through voluntary conservation measures. "This reflects the public's remarkable water-saving response and our conservation and outreach programs prior to and during the five-year drought," said Metropolitan board Chairman Randy Record. Rebates for indoor and outdoor water-saving devices that were crucial during the drought are still available. Learn more at bewaterwise.com. Looking to possibly increase Southern California's future water reserves and better position the region to address climate change, the board of directors approved an initial down payment to participate in a proposed large off-stream project in Northern California called the Sites Reservoir. Read the press release. The San Diego County Water Authority continues to mischaracterize Metropolitan's practices and its important role as a regional water provider. Five regional government agencies, including Metropolitan, have announced the framework of an agreement that lays the groundwork for the long-term potential development of community recreational facilities surrounding MWD’s Diamond Valley Lake. Read the press release.